The main idea of journal FU “Working and living environmental protection“ is to provide fast and efficient way to access papers with the latest research topics that are connected with a research fields of this journal. Papers should be connected on any way with research fields of working and living environmental protection, but they are not strictly limited just to those fields. If the authors provide a previously published conference or journal paper, editor will check if there is sufficient new material added to new version of paper. Our guideline is that the submission should contain a significant amount of new material, that hasn’t been published anywhere else. The paper submitted in the FU “Work Liv Envr Prot” should differ from previously published material by at least 40%. Papers submitted for publication must be written in English. The text should be concise. As a rule, papers exceeding 16 type-written pages, will not be published. Manuscript must be typed double-spaced, on one side of the sheet only. Under title, names of authors should be given, at the end of the paper the full name (with official title, institute or company affiliation, etc.) and exact address should appear. Each paper should be preceded by brief summary (50-150 words) in the same language. Letters, figures and symbols should be clearly denoted so that no doubts about their meaning can arise. Symbols which may lead to confusion (e.g. letter 1 and figure 1, figure 0 and letter O) should be distinguished by marks which are explained in “Remarks for typesetter”. Equations should be typewritten and, with the number, placed in parentheses at the right margin. Reference to equations should use form “Eq. (2)” or simply (2). All figures should be numbered with consecutive Arabic numbers, have descriptive captions, and be mentioned in the text. Figures submitted must be of a standard high enough for direct reproduction. Line drawings should be prepared in electronic form. Figures should be planned in advance, so as to allow reduction to 12,75 cm in column width. Connor, J. J., Logcher, R. D. and Shing-Ching, C.: Nonlinear Analysis of Elastic Framed Structures, J. Struct. Div., ASCE Vol.ST6, pp. 1525-1547, 1968. Arriaga F. and others: Grading and load carrying capacity determination of old timber beams, American Society for Agricultural Engineers, paper No 92-4068, 1992. J. N. Reddy: A refined nonlinear theory of plates with transverse shear deformation, J. Solids and Struct., Vol. bf 20, pp. 881-896, 1984, Comput. Struct., Vol. 5, pp. 257-260, 1975. References should be quoted in the text by the corresponding number in square bracket. Online submission system, electronic peer review and production make the process of publishing your articles simple and efficient. If your paper is accepted, we will try to publish it in the current issue. 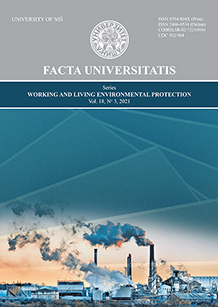 The journal Facta Univesitatis, Series: “Working and living environmental protection” is indexed in a representative list in major database. More info can be found on page <<indexing>>.